Levolution is fundamentally a process. It is the process by which the material structures of the universe have formed. The process involves natural selection, the differential survival of discrete entities. Natural selection operates to favor those discrete systems that maximize their entropy production. Entropy production is equivalent to the overall energy throughput rate for a given system. The interesting thing is that there is a pattern in energy flow that consistently increases energy throughput in discrete entities. That pattern is the "dissipative structure" pattern. Existing populations of discrete systems are sculpted into specialized parts of the next larger system in the process of Levolution. Dissipative structures that are composed of dissipative structure parts are holosystems. There are twenty-three levels of holosystems known in the universe. 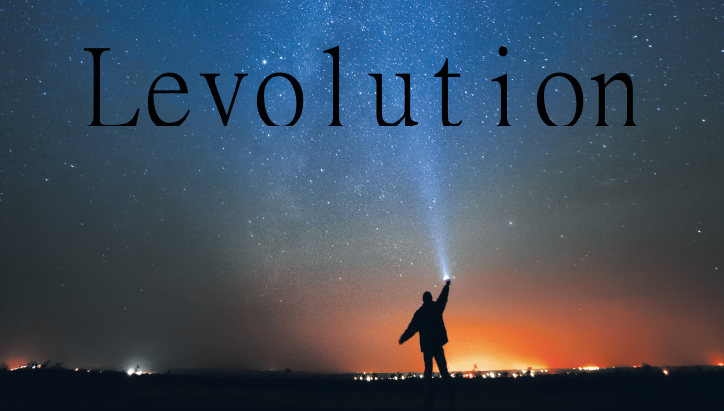 Consideration of the process of Levolution led the Author to the Paradigm of Levolution. An entire set of new and untested scientific principles are unleashed when Levolution is itself elevated to the level of a thermodynamic law. Levolution is no ordinary theory. Nor is it one whose relevance only extends to one specialty, discipline, or level of organization. Levolution is a theory about how the levels of organization originated. To begin understanding Levolution, one must begin by understanding the apparent goal of the universe, which thermodynamics says is to degrade and dissipate the energy that is here down to zero energy potential, a state sometimes called entropic doom. The things that aid in this very directional project are functional to the universal mission. Conduction, dispersion in space, and degradation to less powerful forms are three ways to aid in the entropic mission, but there is a fourth way. Dissipative structures form as a functional, ordered pattern in flows of the energy entering a region. The order or pattern of the structure makes energy flow through it faster. But the thing that always aids in the entropic and cosmic mission the most are those that increase the scale of the systems through which energy flows. Dissipative structure formation, in general, is great, but the Levolution of new levels of order is much better. We would have to understand how photons originated, how some bosons came together to form the graviton, how the gravitons aggregated into the quarks, how these organized into nucleons (the proton and neutron), and how these combined into atomic nuclei. We would have to simultaneously consider electrons joining and stabilizing nuclei of the elements, atoms forming molecules, and all the reactions of chemistry. We would have to consider the creation of the first living cells from cycles and chains of related reactions that came to catalyze each other. We would have to consider the ecological activity in the primordial soup that resulted in modern cells, single-celled organisms, colonies of such cells and, of course, multicellular life, and the fact that each of us is essentially a walking ecosystem. We would have to consider at length the innovation of encoding the functional order as biological genes, and encoding perceptions and evaluations as ideas in brains, and in the memes and constitutions of cultures. These information patterns are symbolic reflections that are easy to copy and replicate. Encoding information allows a faster version of evolution, and we see where energy learned the trick. We could not ignore the roles of organisms in societies, the growth of multi-species cultures, and eco-communities, and we would have to ponder the nature of the only planetary ecosystem we know about. But we cannot even stop there. We must include consideration of the functional order represented on the Gravitational Axis of nested holosystems. 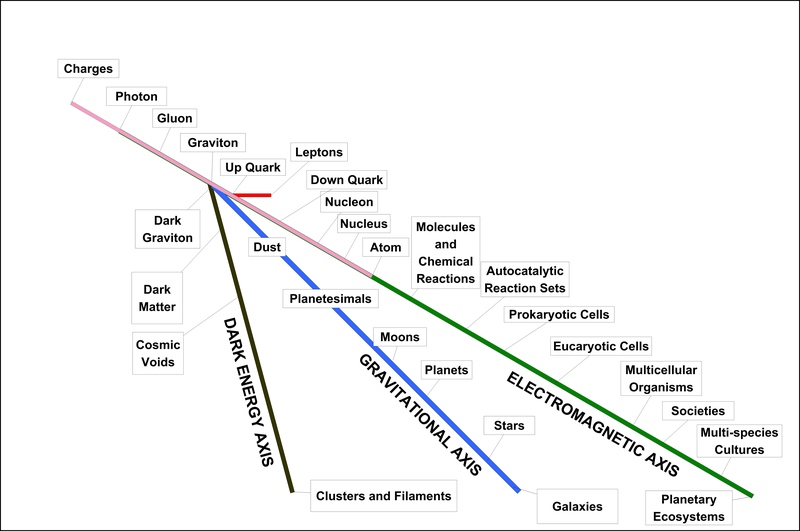 The physics of gravity�s attractive force are covered by the Levolution Theory as well. In fact, use of the Levolution Paradigm unlocks the singularity, the early universe, space, charges, photons, gluons, and gravitons for a new but speculative vision of the beginning. The same pattern of thermodynamically and entropically functional energy flow patterns can be found among all of these entities. The entropically functional order demonstrated in the generalized operations of all of these entities is always of fundamentally the same pattern. The Levolution of holosystems represents the creation of the universe as we know it. Is it important? You tell me.